March 11th, 2016, Charlottetown – Island speed skaters wrapped up the regional short track season on a winning note, winning eight medals at the recent Citadel Cup competition in Halifax. P.E.I.’s eight medals were tops among the eleven clubs in the meet, edging Fredericton, Nunavut and the host Halifax club, who each earned seven medals. Peter McQuaid (right) took top spot at the recent Citadel Cup speed skating competition in Halifax, while Andrew McQuaid (centre) earned bronze in the top division. 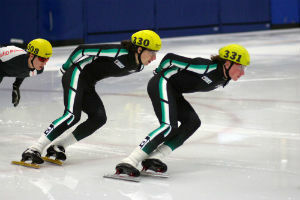 Island speed skaters took home eight medals from the event. Photo courtesy of Kristen Binns. Peter McQuaid of Charlottetown led the way for the Island team, taking the top overall spot in the meet with his Division 1 gold medal. The 2015 Canada Winter Games veteran won three of four distances enroute to the title. Also earning a gold medal for P.E.I. was Stratford’s Mia Stewart in Division 4. Stewart grabbed new personal best (PB) times in both of her sprint events to take the win. Carly Connell (Division 1), Andrew Binns (Division 2) and Jacob Theriault (Division 4) nabbed silver medals for the Island squad. Binns broke his own provincial record in the 400 metre distance for 12 year-old boys, while Connell continued to regain her form after returning from injury. Theriault set significant PBs to close out his strong rookie season with the medal. Bronze medal winners for P.E.I. were Andrew McQuaid (Division 1), Jenna Larter (Division 3) and Matthew McKenna (Division 4). Also competing for P.E.I. in Halifax were Rob Binns, Thomas McQuaid, Kyle Connell, William Lyons, Matthew Kozma, Kristen Binns, Simon Hale, Alex Rogers and Anderson Arseneau. With the regional competitions calendar completed for the season, all eyes are now on Charlottetown and Fredericton, which will host national level short track events in the Maritimes on back to back weekends in March. Fredericton plays host to the Canadian Junior Open Selections #2 meet, while Charlottetown will see the Canada East Short Track Championships presented by Irving Oil come to the Eastlink Centre the following weekend, on March 26 and 27. The Canada East event will see the top 11 to 15 year-old speed skaters from Ontario, Quebec, the Atlantic Provinces and Nunavut, including P.E.I.’s host team of a dozen skaters.